Established in 1903, the La Aurora Cigar Company has been producing some of the best cigars to buy online, let alone at bars and shops for quite some time. Produced and crafted in the Dominican Republic, the La Aurora cigar portfolio consists of the famous La Aurora 100 Year Anos, recipient of Cigar of the Year Honors in 2005 by Cigar Aficionado. 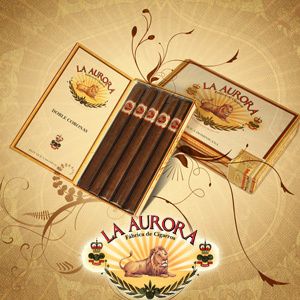 Another cigar line offered is the La Aurora 107, which was made to commemorate the 107 years the La Aurora Cigar Company has been in existence. Last, and certainly not least, are the La Aurora Preferidos cigars which happen to be one of the rarest cigars available. I know that rare is thrown around a lot but these are truly rare. In fact, only 150 of these cigars are made per day. So if we have them, buy La Aurora Cigars, don’t hesitate.